The best way to advertise a mobile business is by using the vehicle you use to get to customers. Vehicle advertising allows you to advertise 24/7, whether the car is parked in front of your business, driving to a customer, or just stuck in traffic. Not only does it help advertise to others in the area while you are at the customer’s location, it also helps your customer identify your vehicle quickly and easily. 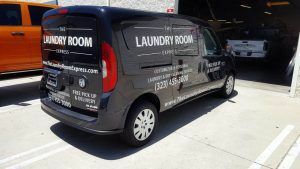 The Laundry Room Express initially found us on Yelp and contacted us for graphics for their Promaster after seeing some of the work we’ve done in the past. 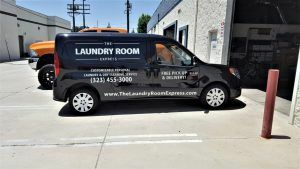 The Laundry Room Express is a customizable and personal laundry and dry cleaning service that offers free pick-up and delivery. Since they had to be driving around anyway, they decided to maximize their marketing by getting graphics on the sides and back of their vehicle. The first thing to consider when getting into vehicle advertising is where to put your logo. The logo is important because it helps the consumer identify the business right away and in this case, the logo conveys what the business offers very well. The back of the vehicle didn’t have any windows so they decided to have their logo span the width of the area. The next thing you want to include is your contact information. Your phone number and website are probably your first choice. 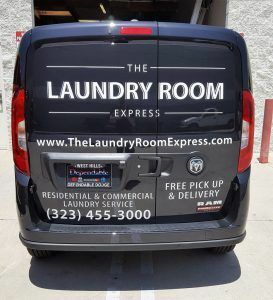 Something like “TheLaundryRoomExpress.com” is very easy to remember, especially in junction with seeing your logo. And if they prefer to call, the phone number is very prominent and easy to take down. It’s hard to imagine how the graphics will look on your vehicle which is why we go through the proofing process to make sure that you are 100% happy with how everything will look before we make it. We went through a few proofs with the owner to resize some components of the graphics. She already knew what she wanted on the vehicle when she first contacted us, but after seeing it on the proof there were a few things she wanted to change. Since we made the proofs without seeing the vehicle in person, there were a few misunderstandings about the vehicle so we were able to make logo, phone number, and website larger. We also moved a few phrases around to make everything look cleaner and easier to read. The white lettering on the black vehicle stands out great and is sure to catch the attention of many new customers.